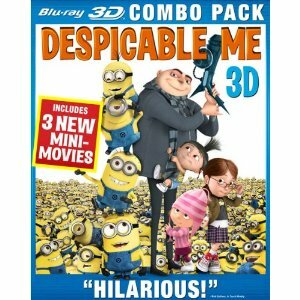 Despicable Me will be released in both 2D and 3D Blu-ray formats on December 14, 2010. The animated title from Universal Studios Home Entertainment will be available in a total of four packaged versions including a 2D Blu-ray/DVD pack, a 3D Blu-ray/DVD “Combo Pack,” a DVD Double Pack, and single disc DVD. Enough to confuse you? Well, we only talk about the Blu-ray versions here. The only difference, it appears, between the Blu-ray/DVD combo packs is that the 2D version contains 3 discs and the 3D version contains a total of 4 discs (with of course a 3D version of the film). All versions of the Despicable Me packaged media come with a digital copy of the film except for the single disc DVD. Universal says that for a limited time copies of both the 2D and 3D versions as well as DVD Double Pack will contain three new mini-movies starring the Minions in “Home Makeover”, “Orientation Day” and “Banana.” Is this just pressure to pre-order or has Universal really only produced limited quantity with the Minions content? Extras on the Despicable Me Blu-ray releases include “# The World of Despicable Me,” “The Voices of Despicable Me,” “Super Silly Fun Land,” “Despicable Beats,” “Gru’s Rocket Builder,” “A Global Effort,” and director commentaries. Features include GRU-CONTROL, MISS HATTIE’S TOP SECRET COOKIE RECIPES, BD-LIVE (with My Scenes), and the pocket BLU app (for the first time on iPad). Pre-order Despicable Me in either Three-Disc Blu-ray/DVD Combo or Four-Disc Blu-ray 3D/Blu-ray/DVD Combo both with digital copies. CORRECTION: Release date for Despicable Me is Dec. 14, 2010.